KABUL, Afghanistan (CNN) -- Afghan President Hamid Karzai bowed to Western pressure Tuesday, agreeing to take part in a presidential runoff vote in two weeks. Hamid Karzai failed to score a first round win in August's election. Karzai, who will face his main challenger Abdullah Abdullah in the November 7 second round, said he was putting his country's interests over his own. "It was not important who the winner is, and we need to leave this to the people of Afghanistan to judge who the winner was," Karzai said at a news conference through an interpreter. "Whether I am the winner or not, it's probably in my interest, but I prefer the national interest of Afghanistan over my personal interests." Western powers, particularly the United States, had been pushing Karzai to accept the final election results in order to ensure Afghanistan has a legitimate government, particularly as Washington considers beefing up its military presence there. Karzai spoke shortly after Afghanistan's Independent Election Commission certified the election results, which gave him less than the 50 percent needed to avoid a runoff. The U.N.-backed Electoral Complaints Commission had invalidated nearly a third of Karzai's votes from the August 20 presidential election because of "clear and convincing evidence of fraud." 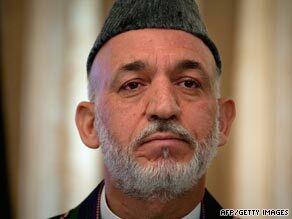 Last month, final uncertified results showed Karzai with 54 percent. "We welcome the decision made by the Independent Election Commission, we believe the session is legitimate, legal and according to the constitution of Afghanistan," Karzai said Tuesday. "It's going to be a historic period that we all are waiting to go through." The International Security Assistance Force (ISAF) in Afghanistan said that it would "support the Afghan National Security Forces' preparations to ensure a safe runoff election." Spokesman Col. Wayne Shanks said that ISAF had been preparing for a possible runoff election "for some time." "As in the election's first round, ISAF will only provide third-layer of security, reinforcing the Afghan National Police and Afghan National Army in line with the security plan signed by the chairman of the Afghan Independent Election Commission along with representatives from the Afghan Ministry of the Interior and Ministry of Defense, and ISAF in 2008," Shanks said. Karzai's decision was immediately hailed by U.S. Sen. John Kerry, one of several Western representatives who appeared alongside the Afghan president at Tuesday's delayed news conference. Kerry, who is chairman of the Senate Foreign Relations Committee, said Karzai's decision to participate in the runoff "will allow the national leadership to govern with legitimacy." Minutes after the news conference concluded, U.S. President Barack Obama issued a statement praising Karzai for accepting the election results and agreeing to a second round of voting. Joe Klein: Will Afghan runoff take place? "While this election could have remained unresolved to the detriment of the country, President Karzai's constructive actions established an important precedent for Afghanistan's new democracy," Obama said. Abdullah told CNN on Monday he was prepared to participate in a runoff, but said "the door is open" to other alternatives. "There are some practical questions ahead," Abdullah told CNN's Christiane Amanpour, citing winter, the security situation "and other realities on the ground." If the election were not held by early November, winter weather would make voting impossible in some areas and force a delay until spring of 2010, according to Afghanistan's ambassador to the United States, Said Jawad. Such a delay, he warned, would be a "recipe for disaster" that would create confusion in Afghanistan and heighten tension between the United States and Karzai's government.